Many brides are choosing to make their own wedding jewelry nowadays. 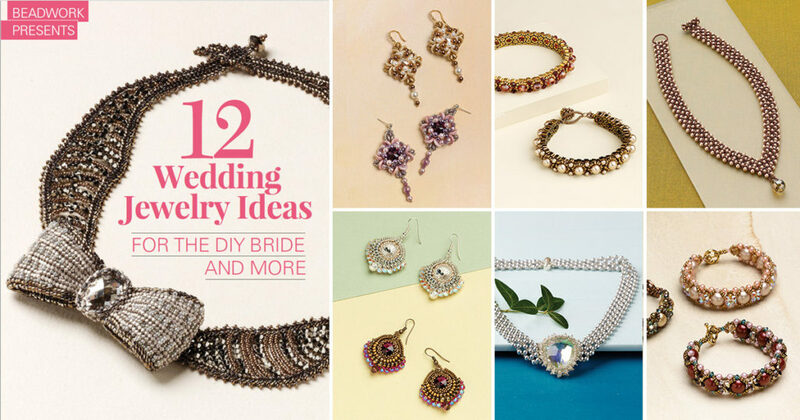 Whether she wants to create something special for herself or for the bridal party, the 12 Wedding Jewelry Ideas for the DIY Bride and More eBook has a gorgeous selection of patterns to choose from. I have made jewelry for many weddings, including my own, and it’s really lovely to have a piece of jewelry in your collection that reminds you of the special day. 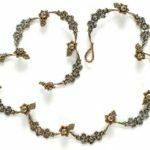 There are wedding jewelry patterns that will suit every style in this eBook, whether you prefer traditional colors like pearls and crystals, want to stand out from the crowd with bold jewel-toned hues, or if you’re a sucker for silver. 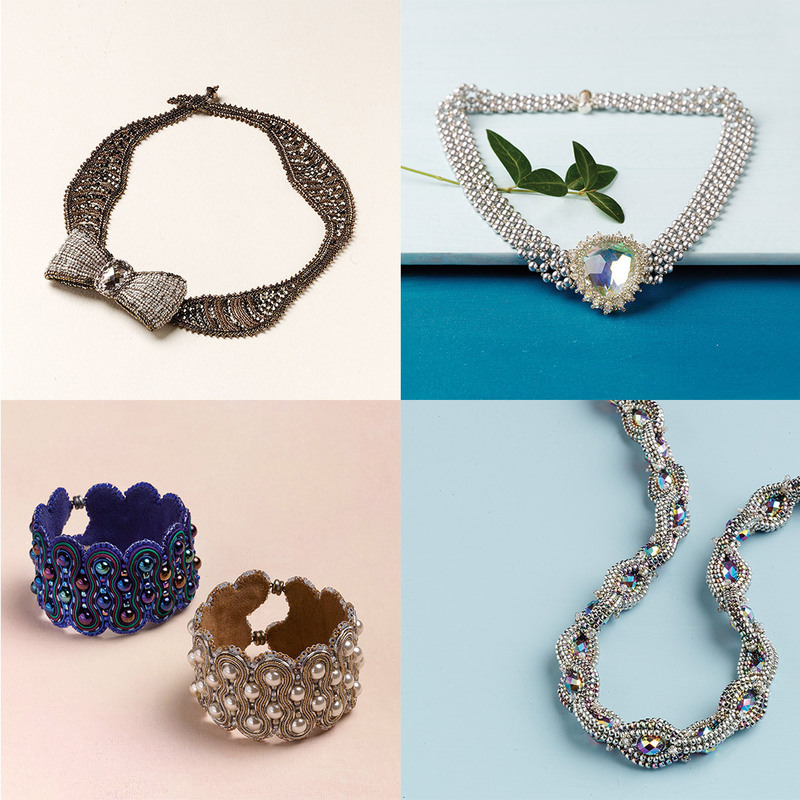 Clockwise from top-left: Elegant Choices Bracelet, Rosebud Rivolis Necklace, Empress Catherine Collar, and Ilona Bracelet. 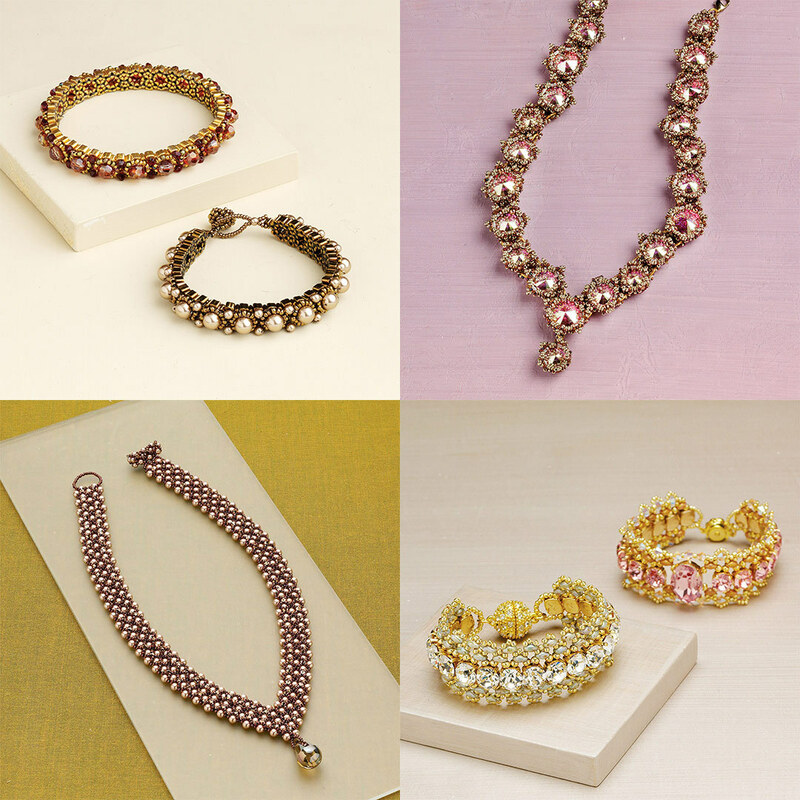 Beaded jewelry with soft, traditional colors is perfect for any wedding. The Elegant Choices Bracelet by Carole Ohl is a rich-looking bracelet with enough structure to be made as a slip-on bangle, or you can add a clasp for a more traditional finishing touch. The sparkling and bright Rosebud Rivolis Necklace by Sabine Lippert and the pearly Empress Catherine Collar by Leslee Frumin both feature a Y-shape that looks great with a variety of dress necklines, perfect for wedding jewelry. Yasmin Sarfati’s Ilona Bracelet is an elegant, sparkly, lacy bracelet that works up very quickly using simple netting techniques. Wedding parties often want to play up an accent color with their jewelry. Choosing bold colors is a great way to make wedding jewelry that will garner the attention it deserves, and be wearable with more casual outfits in the future. The Xs and Os Bracelet by Maria Teresa Moran uses large crystal pearls and fire-polished rounds as a base for this uniquely colored and structured take on the cute Xs and Os motif. Monica Vinci’s Incanto Earrings use Swarovski crystal rivolis for a pop of bold color, surrounded by a medley of pearls, crystals, seed beads, and shaped beads to give them an interesting shape and depth. Csilla Csirmaz’s Enchanted Rivoli Earrings are deceivingly simple to make, formed by first bezeling a rivoli, then wrapping it with a herringbone-stitched rope. Carole Ohl’s stunning and regal Pompadour Bracelet is inspired by Madame de Pompadour, a patron of the arts and member of the French court in the 1700s. The navette-shaped crystals are a gorgeous way to add color to a wedding party’s look. Clockwise from top-left: Silver Tie Affair Necklace, Summer Soiree Necklace, Swingin’ Soutache Bracelet, Chain of Jewels Necklace. Silver is a classic color choice for wedding jewelry. It goes with everything, adds some glitz and sparkle where you want it, and opens up more bold design choices without being too casual. Glorianne Ljubich’s Silver Tie Affair features a beautiful herringbone-stitched bow that floats along an undulating necklace strap, forming an elegant and feminine answer to the classic bow tie. Marcia DeCoster’s Summer Soiree Necklace, with its clean lines and subtle embellishment, is the perfect piece to complete a wedding ensemble. Marcia cleverly beaded around an upside-down, see-through pendant, giving the appearance of a rare crystal rivoli. Amee K. Sweet-McNamara’s Swingin’ Soutache Bracelet is a tantalizing taste of the art of soutache while creating this sweetly simple, soft cuff. Cristie Prince’s Chain of Jewels Necklace uses double-layer herringbone stitch to form the undulating strips that hug the sparkling crystal rondelles. 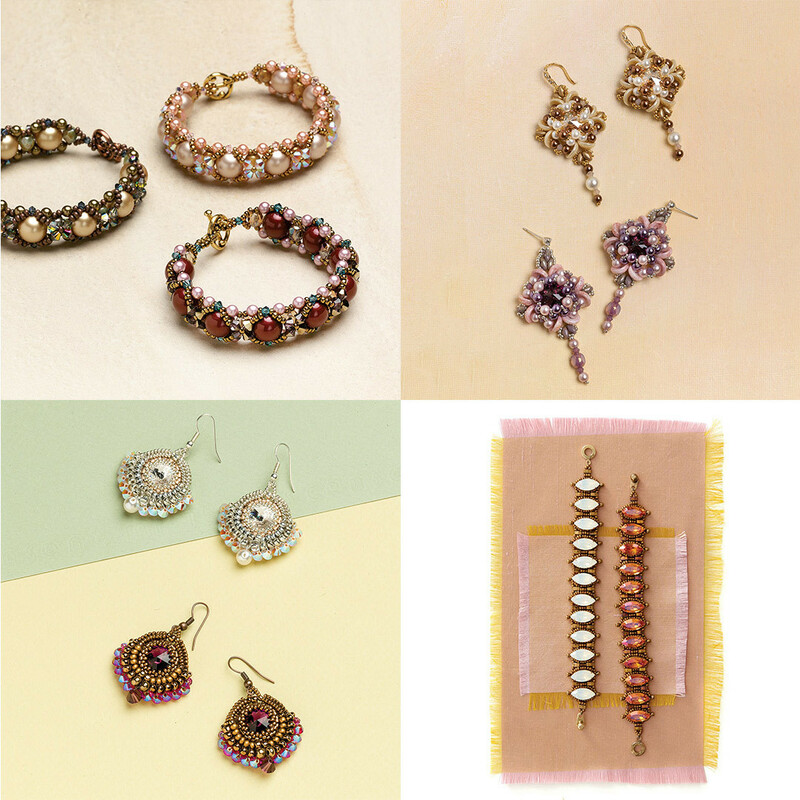 With a well-balanced array of projects with difficulty levels from total beginner to advanced beader, the 12 Wedding Jewelry Ideas for the DIY Bride and More eBook is a great resource for beaded wedding jewelry. If you’re a DIY bride, put your personal touch on your wedding by making your own jewelry.